The municipality of Serinhisar (14,896 inhabitants in 2012, 10,472 in the town proper; 22,618 ha) is located 40 km south-east of Denizli. 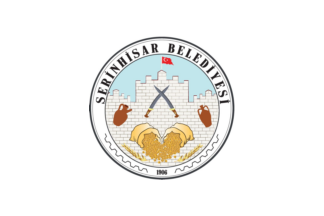 The flag of Serinhisar (photo) is with the municipality's emblem in the middle. "Belediyesi" means "Municipality". The former flag of Serinhisar (video) was white with the municipality's former emblem in the middle. The emblem of the municipality recalls its ancient name, Kızılhisar, "a red castle", changed in 1987 to Serinhisar, "a cool castle". Kızılhisar was named by the Seljuk Turks for the brick fortifications that protected the place, which were already ruined in the Ottoman period and eventually demolished in 1954. Pottery is a significant activity in the town. The former municipality of Yatağan (2,780 inhabitants in 2014) is located 10 km east of Serinhisar and 50 km south-west of Denizli. The flag of Yatağan was white with the municipality's emblem. "Belediyesi" means "Municipality". The emblem of the former municipality features an anvil and two crossed swords. According to legend, the town was conquered by a Seljuk commander and blacksmith named Osman Bey, whose cognomen was Yatağan Baba (Father Yataghan). Yatağan Baba later settled there and invented the yataghan type blades, and gave his name not only to the town, but to the weapon he invented and produced there. But today scholars indicate yataghan type blades were used by Turks earlier than 12th century. Recurve blades and "eared" handles can be traced back to Central Asia, where this type of bronze knives were found in several Bronze Age archeological sites. Etymology of the term yataghan is considered to come from Uzbek tribe of Kataghan or given because of the way the knife was carried in "lying down" fashion in the belt (yatağan means "the one which lies down" in Turkish). In Ottoman period, yatagans were also made in all the major cities of the Ottoman Empire, particularly Istanbul, Bursa and Plovdiv. One of the finest and earliest examples of the type was the weapon made for Suleyman the Magnificent, who ruled over the Ottoman Empire from 1522 to 1566. This specimen now lies in the treasury of the Topkapi Palace in Istanbul and is of particular interest since it is not only dated 1526/7, but also has the name of the artist who made it, Ahmed Tekelü, on the back of the blade. The hilt is of ivory overlaid with gold delicately carved with cloudbands and scrolls.